Students should not arrive before 8:25 each day unless arrangements have been made with a teacher ahead of time. Students will wait out in front of the building until the 8:30 bell and then they may walk down to their classrooms to start their day. Our mission is to foster a reflective and joyful learning community where students respect diversity and use their hearts and minds to positively impact the world and set the course for their life long journeys. 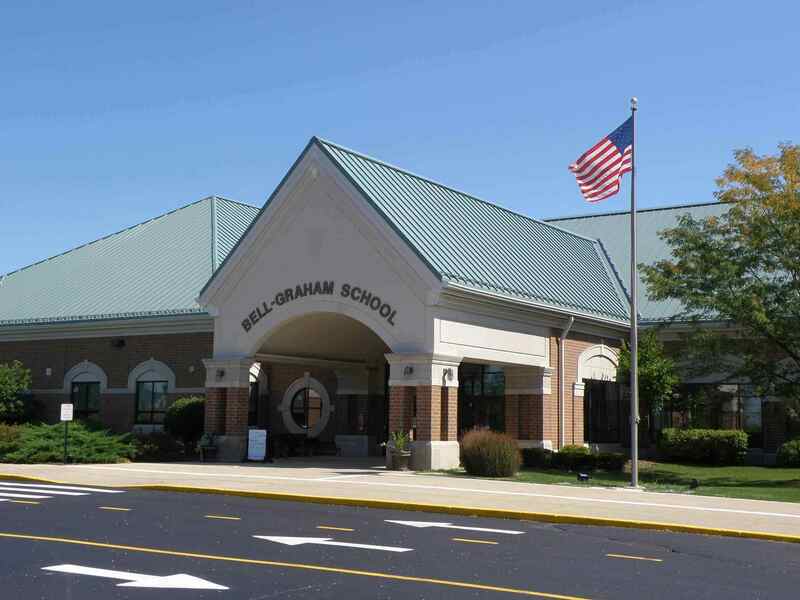 Bell Graham opened on September 5, 2000 and was dedicated on October 1, 2000, in honor of retired educators Charles Bell, Kenneth Graham, and Robert Graham. In 1967 Charles Bell began his career in District 303 as a teacher at Wasco Elementary School. After five years in this teaching assignment, Mr. Bell served a variety of administrative roles over the next 14 years. He served as principal at Richmond School for three years before being named principal at Munhall School, where he remained for 11 year prior to retiring in June, 2000. Kenneth Graham began his career in District 303 as a teacher in 1966. After ten years of teaching, he spent the next 24 years as a principal at Richmond Elementary School and Davis Elementary School. His tenure at Richmond lasted six years when he was appointed principal at Davis, where he stayed for the next seven years. He then returned to Richmond where he remained for 11 years until his retirement from the district in June, 2000. Robert Graham joined District 303 in 1966. Following a three-year teaching assignment at Munhall School, Mr. Graham became principal of Wasco Elementary School where he remained for the next 20 years. In 1989, he was named principal at the newly constructed Ferson Creek School where he served for one year before assuming the responsibilities of the Assistant Superintendent for Personnel. Mr. Graham was Assistant Superintendent for ten years prior to his retirement in June, 2000. These three individuals have a combined service of 101 years in District 303. During those years Charles Bell, Kenneth Graham, and Robert Graham exemplified the spirit, caring and success of Community Unity School District 303. Bell-Graham's student population in the fall is expected to be approximately 400 students. In addition to the principal, the office is staffed by two full-time Administrative Assistants, and a full-time nurse. The LRC is staffed by a director who is a certified library/media specialist, and two one part-time assistant. There is also a full-time custodian available during the school day. Depending on class sizes, the staff can also include several classroom instructional aides. All people have worth and should be treated with respect and dignity. Everyone is unique and has special talents to contribute. All children have the ability to learn and experience individual success. When expectations are high, realistic and supported, they yield higher results. The learning environment needs to be a safe, secure, nurturing place where everyone is included as part of a community. Our mistakes enable us to grow. Cooperation and participation are hallmarks of learning. We all have rights and should accept responsibility for ourselves and our actions. Schools need to cultivate partnerships among students, teachers, family and community. We all must model the behaviors and characteristics we wish to see in others.